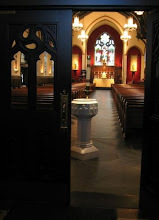 For severals decades, the Catholic Church has been rent by what might be called psychological schism, meaning that (the Lefebvrists aside) there has not been a visible, juridical schism in the Church in the years since the Second Vatican Council but there has been, usually just below the surface, a true and widening gap in the Church between those who confess that the Gospel of Jesus Christ is the power of God unto salvation for all who believe and those want the Catholic Church to become the Episcopal Church. The latter group is loosely organized around various leftists causes, but it has clear leadership (e.g. the Leadership Conference of Women Religious or LCWR), and it has publications (Commonweal, the National Catholic Reporter, etc), and it has institutions (e.g. Notre Dame and every university "in the Jesuit tradition"). What this coalition has not had until now is the chutzpah to declare themselves openly in rebellion, but that has now changed. The first visible crack came last year when prominent members of the LCWR effectively refused to cooperate with an apostolic visitation of women religious in the United States ordered by the Holy See. And now in the national debate over Obamacare, we finally see the psychological schism becoming an institutional schism: the Catholic Health Association and the women religious associated with Network: A National Catholic Social Justice Lobby have publicly repudiated the authority of the Bishops of the Catholic Church in the United States by encouraging the Congress to accept legislation that will force all Americans to pay for abortions. This, of course, is a direct challenge to the authority of bishops to teach, sanctify, and govern the Church, and until and unless that challenge is answered, the schism will only grow wider and more public, until finally the psychological schism is a juridic schism. I'm not sure that this would be an entirely bad thing. Given that there are legions of baptized (and ordained and solemnly professed) Catholics who no longer "believe and profess all that the holy Catholic Church believes, teaches, and proclaims to be revealed by God," perhaps it is time for a reckoning to take place. Those who belong to the Church in truth can only be well served by calling to account all those who do not, particularly when they hold ecclesiastical office.